Good on YOU. I saw first hand what a criminal debacle it was in Florida. A national disgrace. People forced to wait in the sun for 3 to 4 hours for days of ” early ” voting. A woman caught sneaking trash bags of paper ballots out of those same polling places. If you can’t do it on merit, do it with subversion. The Dis-United States of Communist China……. Up in the burbs my husband and I were #32 and 33. We’re usually about 3 and 4 so it was nice to see such a hefty turnout already especially since a lot of our area still has no power. 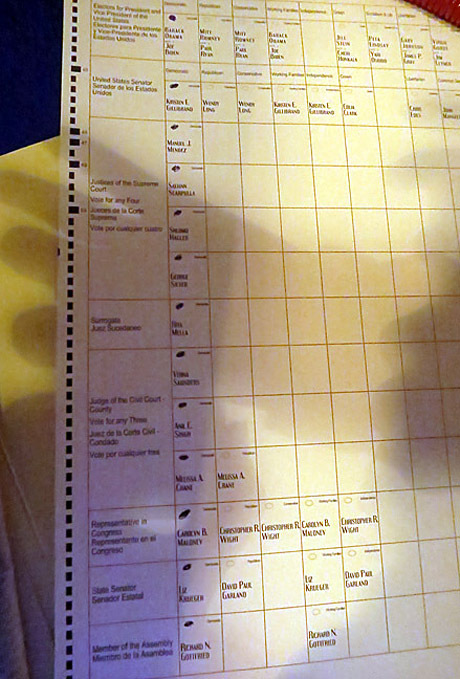 Interesting how the ballots look so different. I voted straight across, not down. Very strange not to be voting for Nita Lowey. We got redistricted and I don’t like it one bit.